University of Arkansas was founded in 1871 as a land grant college. The campus overlook the scenic Ozarks. Before the University of Arkansas were the famous “Razorbacks” they were the “Cardinals”. The name change came when a winning coach informed a crowd of fans that the players performed “like a wild band of razorback hogs.” The students loved the comparison and thee name was changed in 1910. The University of Arkansas has a revered tradition that is unique among universities A tradition was started in 1905 by the senior class. They carved their names into the sidewalk. Each class has added their names til now the sidewalk is 5 miles long and contains over 120,000 names. 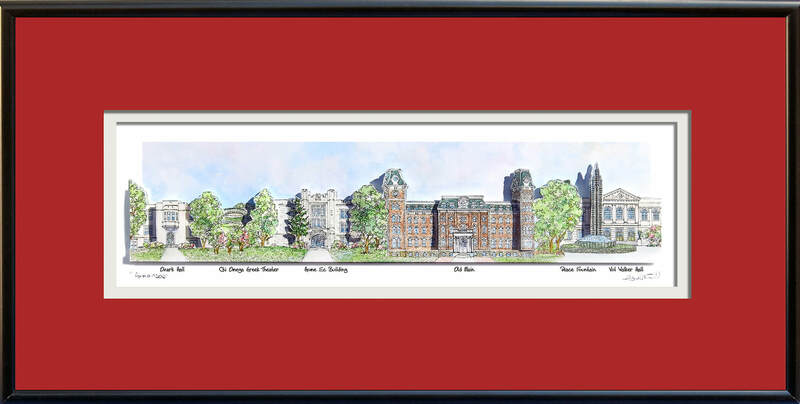 The buildings depicted in the drawing are Ozark Hall, Chi Omega Greek Theater, Home Economics Building, Old Main, Peace Fountain, Vol Walker Hall. Old Main, built from all local materials, was originally called University Hall. Your school’s artwork was created by hand using pen, ink, and watercolor. The paper is hand cut and layered to give the work a creative three-dimensional appeal. The image is 3.5” x 12.5” and is framed with a mat in a 9” x 18” quality, black metal frame.